Given our liberalized operation, we are having problems handling it after our temporary staff contract expires. We have been employing temporary staff to handle our distribution center operations, but their dispatchment period will expire soon and we are pressed with the need to revise our system of operation. We are considering whether to go for in-house production or outsource manpower. While we hope to cut back on costs with better efficiency, as the operation fluctuates greatly depending on whether business gets busy or quiet, we are concerned that by outsourcing the fixed payable charge will be high. PERSOL GROUP analyzed the actual operations and tasks and proposed measures to enhance productivity through eliminating redundant tasks and to reduce costs through adequate staff allocation. We began by first defining all operations to sift out actual operations that are redundant under the definitions. Definition of ‘picking’ was: ‘Confirmation of list’ → ‘Move to display shelves’ → ‘Retrieve applicable item’ → etc. Actual operation was: ‘Confirmation of list’ → ‘Search display shelves’ → ‘Move to display shelves’ → etc. 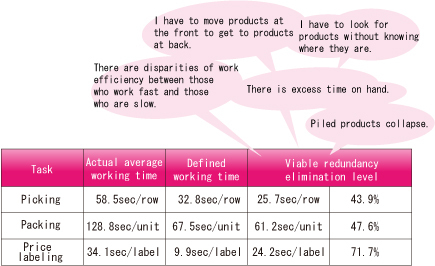 In addition, we clarified how much elimination of operation was possible by comparing the average of the time that would be required if operations were to be implemented as defined and the actual operation time. We forecasted the distribution volume by indexing past data on the fluctuations in distribution volumes by month, by week, and by the day of the week. Based on the forecast, we then devised a plan for staff allocation. Furthermore, thanks to our ability to supply manpower, we created a system where it was possible to rapidly increase the number of staff to handle any unforeseen, sudden increase in distribution volume that would otherwise have been difficult to implement under in-house production. Through implementing these 2 measures, we helped our client reduce more costs than when under in-house production. In terms of the elimination of redundant tasks, a working environment was created wherein all operation members can now be constantly aware of making improvements and the elimination of redundant tasks is ongoing.